Narendra Modi historic visit to Bangladesh: Ruined by a sexist comment. 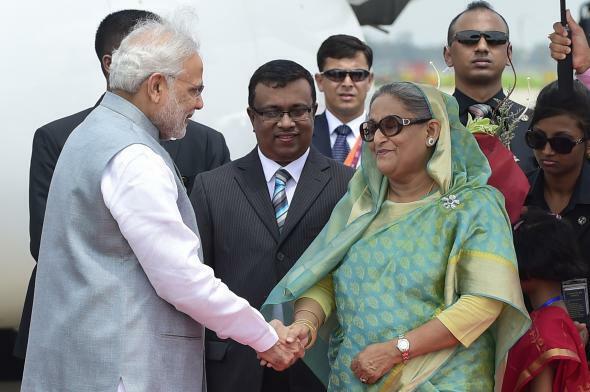 Despite being a woman, Bangladeshi Prime Minister Sheikh Hasina welcomed her Indian counterpart, Narendra Modi, upon his arrival in Dhaka. When Prime Minister of India Narendra Modi took office last year, many in neighboring Bangladesh looked on warily. The Bangladeshi government had been close to Modi’s rival, the Congress party, and many in the predominantly Muslim country were understandably concerned about his past ties to militant Hindu nationalism as well as his harsh rhetoric aimed at illegal immigrants from Bangladesh. But for the most part, the prime minister’s first visit to Bangladesh went impressively well. He negotiated a land-swap agreement with Bangladeshi Prime Minister Sheikh Hasina, one that could bring an end to a 40-year-old territorial dispute between the two countries. He surprised many by announcing that he was extending a $2 billion line of credit to Bangladesh, a move likely aimed at countering Chinese checkbook diplomacy. And he gave a rousing hour-and-a-half-long speech in which he peppered in some Bengali phrases, paid tribute to the two countries, shared history, and praised Bangladeshi efforts to combat terrorism. Surprising the ones promoting #DespiteBeingAWoman maintain a stony silence on atrocities on women in Islamic countries. As it happens, Bangladesh has been ruled alternately by two women—Hasina and her archrival Khaleda Zia—for most of the last 25 years. Politics in Modi’s own country has also been dominated by powerful female leaders, including Congress Party leader Sonia Gandhi and her mother-in-law, former Prime Minister Indira Gandhi. Hasina, a hard-as-nails political infighter who’s been accused of using the elite anti-terrorist police as a death squad to eliminate rivals and advance her family’s interests, seems like a particularly odd leader to say this about. There’s plenty to criticize about her, but nobody should be surprised by her toughness at this point. With one remark, Modi turned a potentially historic moment where he had an opportunity to prove his critics wrong into another example of his chauvinism.